On June 28, 2018, SEC Chair Jay Clayton issued a public statement giving high praise to the Dodd-Frank whistleblower program. The Dodd-Frank Whistleblower Program is also known as the SEC whistleblower program. 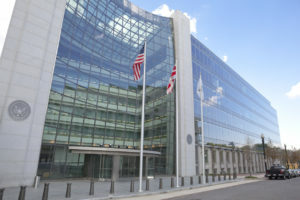 The SEC’s Home Office, Washington, D.C.
To read about the Commissioners’ separate comments regarding the Dodd-Frank whistleblower program, click here, here, and here. In his statement, the SEC Chair called the Dodd-Frank whistleblower program a “groundbreaking program”. Among other things, he acknowledged that the Dodd-Frank whistleblower program “is a critical component” in the SEC’s enforcement toolbox. SEC Chair Jay Clayton is an Independent. He was appointed by Republican President Donald Trump. Mr. Clayton’s predecessor as SEC Chair, Mary Jo White, was a Democrat appointed by President Barack Obama. Thus, the two most recent SEC Chairs — one a Democrat and the other an Independent appointed by a Republican — have both lavished praise upon the SEC whistleblower program.